Another piece from an article I linked to earlier. Mobile is coming and it's coming quickly - our educational institutions need to begin moving now (actually a couple years ago) if they don't what to get caught flatfooted. Need to make the case to your college administration? Consider sharing the quote below - with emphasis on the phrase "lost monetization opportunity" along with the following graphs. It’s also another reminder that content owners and publishers should be preparing for more people using mobile devices to consume their content. Right now, many sites are still not optimized for mobile, which can be a lost monetization opportunity. Make no mistake; the world is turning mobile, and it’s happening right now. Better to get with the program than get left behind. A clear shift from desktop/laptop operating systems to mobile devices and OSs. In fact, Windows and Mac OS X dropped from 64% to 36%. That's more than just a shift, it's a disruption - an almost immediate upending of long standing and expected hierarchies. Will we this erosion of traditional OSs in favor of mobile continue? I think so. Consider the data consumption of the iPad - 4 times that of smartphones. Combine that with the fact that the tablet market is still in it's infancy; as that market grows, we should expect to see a corresponding growth in mobile data usage. Mobile devices, led by the iPad and Android phones and tablets, have overtaken computers on Wi-Fi networks, according to a new report from cloud networking provider Meraki. It’s another sign that mobile is increasingly the way people access the Internet, bypassing traditional computers in their hunt for information. Meraki said that in 2010, Windows and Mac OS X accounted for 64 percent of devices that accessed Wi-Fi networks, while iOS (the iPhone and the iPod touch at the time) accounted for 32 percent and Android was just 1 percent. A year later, iOS — bolstered by the iPad — and Android now represent 58 percent of Wi-Fi devices, while Windows and Mac OS X account for 36 percent. The numbers have gone up since March, when Om got some Wi-Fi usage statistics from Meraki, which found that the iPhone accounted for 23.5 percent of connections, while Android had 5.2 percent and the iPad took 3.4 percent. The iPhone was the most popular device on Wi-Fi networks, with a 32-percent share. Android now accounts for 11 percent of devices on Meraki’s networks, equal to the iPod touch alone. Those numbers will certainly increase for Android as its installed base grows. Meraki also found that the iPad was a power device, consuming almost 200 megabytes per month, about four times as much as the average for Android, iPhone and iPod touch devices. John Siracusa and Dan Benjamin in the first 10 minutes of their podcast Hypercritical discuss searching Google for a brief audio clip from The Simpsons. Instead of getting a useful result, Siracusa gets links to a bunch of static videos (just an image with audio) that link to SPAM. He points out that this is a case of Fox - the owners of The Simpsons - not protecting their brand. He suggests that Fox should be posting clips of the Simpsons - either on YouTube, a site they control, or somewhere else, rather than letting others post the content. Fox could limit the length of these clips and add links to paid content or alternatively use an ad supported model. In the end, it's important for Fox and The Simpsons - and for any small company or organization (even individuals) - to control their brand. When someone searches Google for your brand, the top hits should be your brand! Man, you would think with two CEOs you would be able to foresee this kind of thing. Earlier I posted Part 1 and Part 2 of Everything is a Remix - here Part 3. Brilliant stuff from Kirby Ferguson. The new Nokia N9. Not running Microsoft's Mango, but instead MeeGo. Very engaging, catchy video. Hope the phone is as engaging. The WebOS nuts at PreCentral have received an anonymous tip-off that HP's imminent slate won't be able to edit Office docs out of the box. As companies like Sony and Citibank identify the causes of recent security breaches and try to remedy network weaknesses, area businesses are well aware of potential threats. Yet, improving security is more than beefing up firewalls or installing better encryption technology. The weakest link remains the individual employee, who may be using less secure email services or carelessly leaves sensitive data unsecured, analysts say. Skype Technologies SA, the Internet- calling service being bought by Microsoft Corp., is firing senior executives before the deal closes, a move that reduces the value of their payout, according to three people familiar with the matter. Great thoughts on the downfall of Nokia and RIM from Horace Dediu. I encourage you to listen to this episode, subscribe to the podcast, and read Dediu's Asymco blog. Really smart guy! Very clever little app! Brilliant use of the iPad2 smart cover. I can see this becoming the go-to flashcard/study app. One of the best parts of the iPad 2 is the colorful, magical smart cover that comes as a peripheral. Lift the cover and your iPad turns on, drop it and it goes to sleep. It’s kind of addictive. But what if someone actually built an app around that fidgety behavior? Well, Evernote just did. It’s called Evernote Peek, a free app for the iPad 2 that is designed around the smart cover. It is the first smart cover app, and it may even make you smarter. Evernote Peek is a simple Q&A quiz app. You lift the cover a little and to see a question like “How fast does light travel?” or “Who was the fifth President of the United States”? Then lift the cover a little more to see the answer. Steve Martin @SteveMartinToGo parodying his famous line from the movie The Jerk. I have no inside information, this is just based on observation and intuition. Last weeks release of universal versions of Keynote, Numbers, and Pages - versions that work on the iPhone and iPod touch, in addition to the iPad got me to thinking. 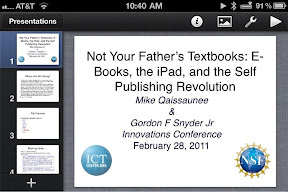 It would be really useful if I opened Keynote on my iPhone and all of my presentations from my iPad were just there. Dropbox already does this and so does Apples' iBooks app. So among the announcements I expect today at WWDC is support for syncing of Keynote, Numbers, and Pages documents among all my idevices through the iCloud service to be announced today. A bonus might be access through the desktop versions of the apps as well, but that might have to wait until OS X Lion. The problem with the announcement is that Microsoft has failed to commit to the tablet as a unique type of device. The company that spent a decade trying to push Windows tablets on a market that just didn’t want them is still convinced that it’s a selling point that Windows 8 tablets will run Microsoft Excel for Windows and if you hook up a keyboard and mouse to them, you can get an arrow cursor and click to your heart’s content. while it would be so easy to just write Microsoft off as a completely clueless company that’s just living off its former glory, the fact is that there’s some very interesting work going on at Microsoft. It just seems to be stuck inside a company that can’t let go of the past in order to embrace its own promising future. Linus Torvalds, the creator of the operating system phenomenon Linux, tells the story of how he went from writing code as a graduate student in Helsinki in the early 1990s to becoming an icon for open source software by the end of the decade.